Posted in News on March 21, 2019 by Sports Video Group. 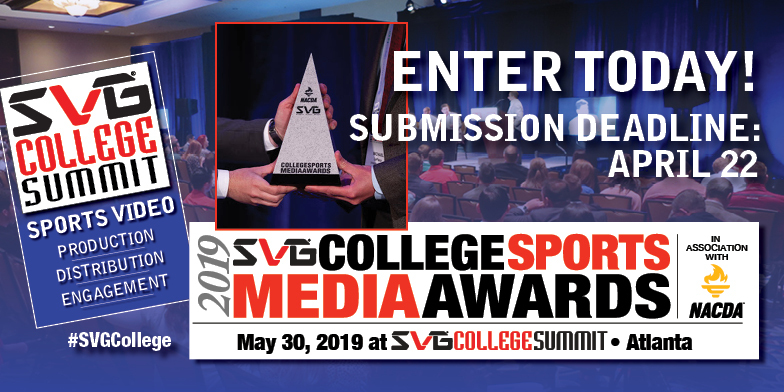 The 1th-annual SVG College Sports Media Awards in association with NACDA (CSMAs), college sports video’s most prestigious awards, is looking for the year’s latest and greatest produced pieces! The submission window is still open, but the window will close in one month. Be it a thrilling live game broadcast, a comprehensive studio show, a heartwarming feature piece, or a stadium-rocking hype video, submit your productions and compete against your peers by entering at www.collegesportsmediaawards.com. The deadline to enter this year’s competition is April 22. This year’s competition features a restructuring of two divisions with, for the first time, Conference Offices and Governing Bodies competing in their own division. In addition, all media organizations — including national networks, regional sports networks, third-party packagers, and independent production companies — will compete in the new Professional division.